Adding an Admin to a Facebook Page | Tech Lab Inc.
2. In the upper right corner, click the drop down arrow and open the menu to manage pages. 3. Click to choose the Page you would like to administrate in this list. 4. Once you are viewing the Page, click settings. 6. 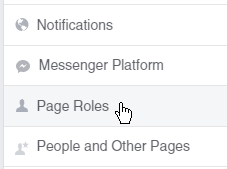 Scroll down a bit and in the section titled “Assign a New Page Role”, type the person’s Facebook name and change the drop down menu to “Admin,” then click “ADD”. ← Don’t Fall for the Scam!